A young boy’s bedroom calls for a recipe of restful, whimsical and fun! This sleeping boy remains safe alongside a massive brick wall, a flickering torch and sparkling stars illumating night’s shadows. A haven of soft grayish blues, greys, black and white mesh together to create a restful little corner with a touch of fun. The messy-made bed suits this boy to a T! A mesh of mixed patterns from new and used finds create a potpourri of bedding bliss. … created from the underside of a piece of scrap wall paneling. Sketch – 2 min. Cut with a jigsaw – 3 min. Painted clouds – 15 min. An under 30 min no cost quick solution for a whimsical valance. At the foot of the bed, is this opening that was the perfect place to stash an armoire, filled with books and blankets. Rather than looking at dark doors to match the rest of the cabinet which would have created a black hole, a bright flat sheet was hung curtain style instead. The ‘no sew curtain’ was left with massive puddling on the floor so the sheet can be used as it’s original intent at a later date if desired. Tip: If you find a sheet with top banding as this one, it has a custom made look. This sheet was part of the bed in a bag set. Wrought iron metal brackets from who knows what (thrift find), created the perfect companion to hold up a chunk of black curtain rod. Between the armoire and the bed was the perfect little spot to tuck in a small desk. The desk top and legs were painted white to lighten up the room against the blue walls. Black details tie in the chair and other blacks in the room, creating abit of added interest to the piece. The bonus is a more masculine looking arrangement, yet doesn’t further darken the room! Tip: Two toned furniture really takes a redo up a few notches. If you’re still painting furniture all one colour, you need to give the two-toned a try. Once you start, you’ll view furniture in a whole new way! With the bed to the left, the fun place to hang is to the right! A lower kid sized play table is the perfect spot for Lego building or doing homework. The table received the same colour treatment as the desk to lighten up the top. A stow away bin always resides under the table for a quick cleanup. Over sized bulletin boards don’t overtake the room when painted out the same colour as the wall, yet allow for amble changeable art displays. More morphing to come in this area… I have big ideas for a larger magnetic board among other enhancements. Tip: lighter table tops allow you to find small toy pieces much easier. This tabletop use to be black and it fatigued the eyes. White solved the problem. To the right of the play table, is a massive dry erase board. Not only is this a total boy magnet for drawing all kinds of boy type things, the board also makes spelling and math practice much more of an adventure! Honestly, my son sits at this thing every single day and creates the most amazing drawings, stories, lists, etc. The ceiling and walls are painted the PERFECT dusky blue that I had created. The brick treatment was stamped on the wall with a brick sized sponge, using an ice cream bucket lid filled with swirled paint. Highlights of black and white were added to each brick with the edge of a cheap sponge brush. I can do a how-to at a later date if there’s interest. It was a very easy treatment, just abit labor intensive. The entire room was wrapped in this treatment. The blue sky was left blank especially for super hero posters, that could be later taken down, leaving the room still somewhat themed for other current likes. The posters are already down so the idea was a sound one! … it’s in the PLAYROOM of course! (the 3rd bedroom upstairs) Being that there is only my son and I in our home and I used up the entire basement for my work, a playroom was created for the overflow of stuff and the need for extra romp room for visiting boys. Tip: if you can separate the bulk of the toys from the bedroom, it becomes more of a study/sleep area. Hardwood floors are in both rooms (actually the entire upstairs) which makes for the most incredible easy to keep clean floor ever! Felt liners are stuck onto anything that touches the floor for floor friendly sliding mobility. 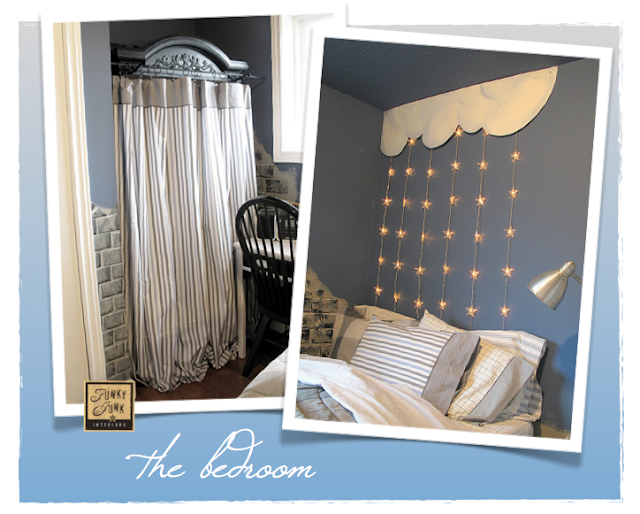 This boy’s room is easy on the eyes, is restful as well as fun! My son is now 10 and with the removal of the Spiderman bedding and posters, this room easily morphed into his current age group by a simple means of just changing out the accessories. Other full room makeovers are HERE. WOW… I am running out of words for your posts… amazing is the first word that comes to mind… it looks fabulous… LOVE the brick treatment… I know first hand that is a very time consuming task… you did a fantastic job it looks awesome… Love your colour choices also… another great job Donna… thanks so much for sharing… I hope your son appreciates his talented Mom. Love, Love, Love everything about the room! It is amazing! The wall is incredible and the grey tones are fabulous. What a special boy to have a room fit for a king! Happy Holidays! You are amezing! My guestion is where do you store thrifts store finds until you use them. That’s my problem. I find things I don’t know what I will do with them but I know they are good finds and something will come up someday. Awesome! My oldest grandson would love this! We just got him two of the castle lego sets for Christmas. He took them home after leaving here Sunday and has already put them together. He has a desk that Grandpa and grandson has been fitting with dungeon bars and paper mache mountains and trees just waiting for Christmas presents to come. What a fantastic room! I love that you honored his needs and desires and made a room that is fun and creative. I love that it can grow with him. What a cool space, Donna! Your boys room looks amazing! Everything in that room is so fun and functional. 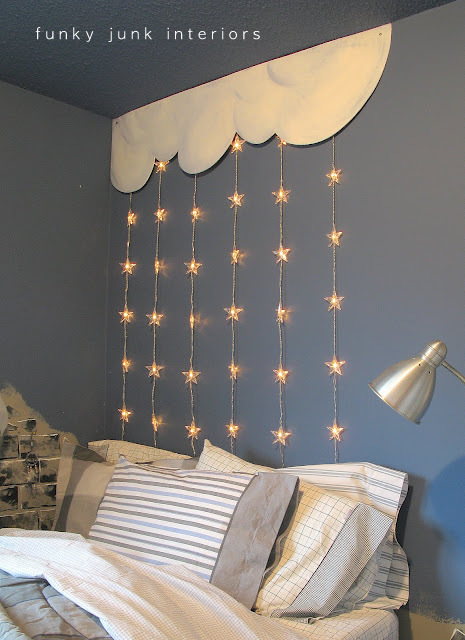 I love that wall storage from Ikea, the bulletin boards, and twinkle lights. What a playful space. Nice work, Donna. Wow Donna! This is absolutely fantastic!! And timely too as I am getting ready to start both my boys rooms! They are currently sharing and now would like their own space! I will be showing my youngest the bricks! The room looks amazing. A perfect theme without going over the top. Lots of great ideas wrapped into one fabulous post. This belongs in a magazine! Really! I’m so impressed I truly don’t know what to say except it’s wonderful and you are incredibly creative and talented. Wow, that room is amazing. There’s so much going on, but it feels so relaxing because of the colors you chose. My little guys would love a room like this. I bet your son enjoys his room so much. You did a wonderful job. Thanks for sharing it with us. One special boy truly does have his own personal wishing star. What a wonderful & creative space! Absolutely fabulous! What a neat boys room, Donna! This looks ageless and I’m sure will grow with him. I don’t even know where to start. This room is AMAZING! I always feel like it’s easier to design and decorate for girls, but this shows that that is just not so. What a great room. I especially love that little stool for the play desk and the marker board. That is just fabulous Donna! That little boy must be ectatic with that room. Each touch you’ve added is more clever than the last! My sons are grown and would probably still love this room. KarenSue, storage is indeed an issue around here as well. 🙂 You do need to grab and hold onto special pieces when you find them. My deal is, I get a new piece and just hang onto it for awhile and leave it in the basement or garage. If it doesn’t make it’s way into my home, then I entertain thoughts of enhancing the piece to sell. I haven’t done the latter yet, but am slowly collecting pieces that I know I won’t keep in order to entice me to get going on the sales part. Awesome room. I don’t know if I’m more in awe of the decorating or the cleanliness of that boy’s room. Wow-totally amazing!! I just love that grey color too-so relaxing! He’s one lucky little King! p.s. Check mine out too! Donna, that looks great! What a wonderful room for a little boy. You always do such neat projects. I love the paint colour and want to re-paint my son’s room. Since we are renting and hoping to be in a house soon I may wait. Hard though – love to paint! I absolutely LOVE what you did in this room! I have three boys, and all of them would love to move in! Wonderful job. Holy moly that room is HUGE! It came out fantastic! I love those Ikea metal bins. I have some hanging in my kitchen! I love this room!! I bet this little guy does too!! Well done! So very creative! That’s awesome, Donna. You’re quite amazing. Awesome boy space! I bet he likes to show off his rooms to his friends. We have a tree house playroom in our attic for our grandkids, they love it. WOW!!!! i love it! the stars are incredible… what a great find. i love how you’ve kept it a rest/study area by keeping the storage area separate! Love it. Yes, the puffy bed looks fabulous! Redoing son’s bedroom since he moved to campus. It is electric green and I wanted nice calm grey. Love the colors, and that bedding is perfect. An adult version is just the thing for his room redo. Thanks, as always, for the inspiration. Merry Christmas. Lucky, lucky boy! This room is just amazing! Lets all relax for a couple days. The New Year is almost here and there is lots of junk out there just waiting for us! Outstanding! Love, love, love it! I’m going to tackle my youngest daughter’s bedroom at some point this year and I’m sure I’ll be coming back to this post. how in the world did i miss this?? Your home is amazing and I LOVE your posts. I just have one quick Question; Is your home a split-level(raised ranch). The reason I ask is that we have a raised ranch and your floor plan is very similiar to ours minus the fact that your entry is on the main floor. LOVE IT!! Do you make this change? Also I am going to try some of your tips and ideas on our livingroom… sooooo cute! THANK YOU!! Very neat and organized. I love the color it looks more comfortable and inviting. do you think the cloud lights would look alight for my 12 year old daughter? Ok, so where is this paint tutorial? Surely I’m not the only one who wants to see it! I would LOVE to do my son’s room’s walls like this. Please, please, please explain!